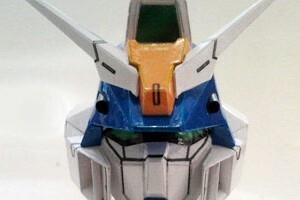 New release from Rino, a new project which is GAT-102 Duel Gundam head part. Rino really amazed me again this time, he is on fire! What is a Duel Gundam? I actually have very little knowledge about Gundam's universe, I wonder how many type are made. From Gundam Wikia I found out that Duel Gundam has a bit similarity then the previous Strike Gundam on the torso, but the whole figure is different in posture and details, its color is dominated with mainly white and blue. Duel Gundam is more muscular in appearance compare to Strike Gundam. 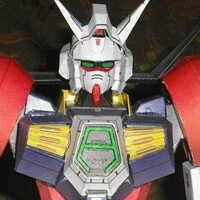 Duel Gundam also equipped with beam rifle and shield and other type of heavy weaponry. Photos below are build by Rino himself as a build test, he used 190 gsm art paper with Canon Pixma inkjet printer to build this Gundam's head. The template is in PDF and assembly instruction is included with PDO file. 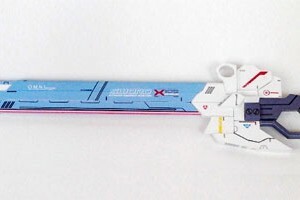 A new weapon add on for Rino's Strike Gundam, a Beam Boomerang. The template as usual comes in PDF and PDO, also for assembly instructions you can refer both to PDF and PDO. This Boomerang add-on is designed to utilize neodymium magnets to assembly each part in its place, but you can always fixed them with glue. For the use of magnets there are special instructions on how to do it in the PDF file. There are only 4 pages to be printed for this part. Photos below were built by Rino using Art paper. This is the first release after my PC back online again due to operating system failure. 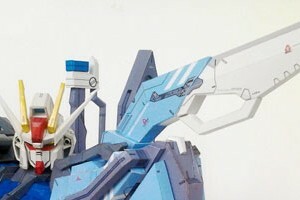 This time Rino shared his Strike's sword template, and this is the coolest Gundam's add-ons I ever see in Paper Replika. It makes me realize I still have a debt for Sinanju Gundam add-on, his rifle cannon. 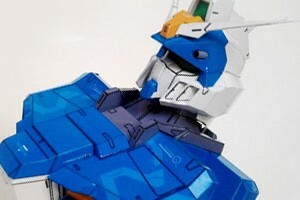 Rino recommends to use magnet to attach the sword, or you can glue it in the Gundam's back. As usual templates come in PDF and PDO format. You must use pepakura viewer to open the PDO file, you can't use pepakura designer because its protected for editing by password. In the last PERI exhibition at Toys and Comic Fair 2012, this Gundam Strike paper model kit is mistakenly observed as a Perfect Grade plastic model kit by some visitors.